These crepes are a welcome change from the typical pancakes. I love to smear peanut butter and a drizzle of maple syrup on mine, but Olivia prefers Nutella. 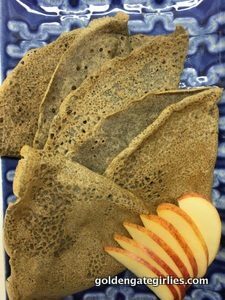 At first, we used 100% buckwheat flour but the taste was too strong for us, so we have gently adjusted Minimalist Baker's version to suit our tastes. If someone in the house prefers a thicker style, closer to a Swedish pancake, pour in more batter. It is super easy to put everything in the blender then pour directly from the blender into the non-stick skillet. It is best if the ingredients are room temperature. We happen to have one of those heat tamers to help keep the crepes from burning too quickly. In a blender, add the ground flaxseed and warm water, let it rest about 3 minutes before you add in the next ingredients. Melt the coconut oil gently in microwave then add to the blender. Add the remaining ingredients, put lid on and blend 2-3 minutes. Batter should be thinner than pancake batter, but not runny as water. Add 1 teaspoon of flour or soy milk as needed. Let the batter rest in blender for 10 minutes (or if your milk was cold let it rest closer to 30 minutes). This rest time allows the flours to absorb moisture and come closer to room temperature. Preheat a heavy non-stick skillet, over the heat tamer (if using). After skillet is hot, turn to medium flame, add drop of coconut oil to skillet, swirl around. Depending on size of your skillet, pour enough batter to cover about 3/4 of the pan then quickly pick up skillet to swirl around batter to reach the edges. If you have too little batter, there will be empty bubble popping up. After about 2 minutes and when the edges look dry, pull back the side of crepe and peek under. When slightly brown, gently flip and cook for another 1-2 minutes more. 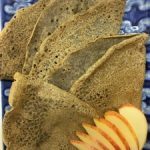 Comments Off on Buckwheat Crepes – gluten free and vegan!